Here’s a great Do-It-Yourself project for tactical shooters. Ed and Steve of the 65Guys.com have created a versatile wooden barricade designed for easy transport. The goal with this design was to create a stable barricade that offers a variety of shooting positions, but can also fit in the bed of a pick-up or the back of an SUV. The 69″ tall barricade is hinged in the middle, so it’s just 27″ wide. To deploy the Barricade you simply fold it open and then nest the lower wings in ground-level stands. We call this the BYOB Project — Build Your Own Barricade. Anyone with basic wood-working skills should find the Barricade prettyeasy to make. The only tricky part is cutting the side Dado joints for the left and right lower wings. But when you’ve got it completed, you have a low-cost unit that is versatile and sturdy yet easy to pack in a truck and carry out on the range. 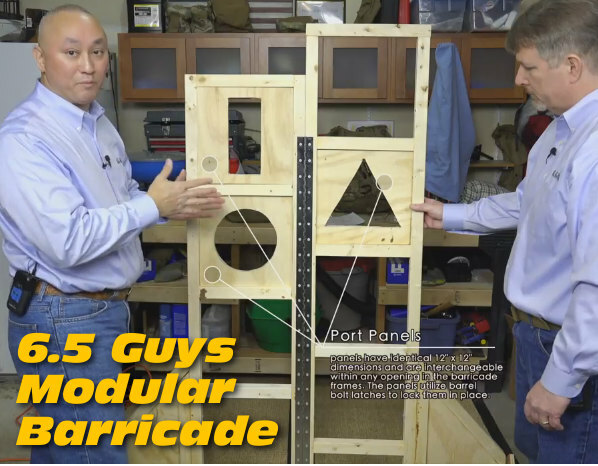 In the video below the 6.5 Guys showcase their Gen 2 barricade and explain how to build one just like it. The Modular Barricade was drawn up by Steve in PowerPoint and then dimensions added. Once the entire plan was created, Steve cut components to size and then used ordinary wood screws and wood glue to assemble the barricade frame. This was done to ensure maximum rigidity due to the light weight construction using 2″ x 2″ frame members. A long piano hinge was used to allow the Barricade to fold in half, while still having high torsional rigidity. Each of the Barricade openings are 12″ x 12″ square. This consistent ‘window’ spacing allows interchangeable panels with different cut-out shapes to be placed at varies heights/locations in the Barricade. — Lightweight construction using low-cost 2×2 wood beams. — Collapsible frame with center hinges for easy transport and deployment. — Multiple Support levels at 6″ vertical intervals (6″ variance R to L). — Modular port design allows ports to be changed and moved as desired. The Modular Barricade can be constructed over a weekend with the proper materials and basic shop tools such as a power saw and electric screwdriver. Steve used a router for the side panel dado joints but a table saw could also be used for that task. Steve’s only real issue with the build involved the port panels — getting them to fit right. The 2″ x 2″ frame wood wasn’t always straight; even a small variation in the wood could cause a port panel to be too tight or too loose. Steve had to do a lot of extra sanding and planing to get the port panels to fit just right. Because the 6.5 Guys’ Modular Barricade is so easy to move, you can simply pack it up and deploy it at your local range for practice. (Do ensure club/range rules allow shooting from barricades.) While the Barricade is designed to sit on the natural ground, the base stands can also be placed on concrete if your range does not allow deployment forward of the normal firing line. While you can use the Barricade for training on your own, Ed and Steve say novice shooters can benefit from a formal clinic. In the video below, the 6.5 Guys discuss precision rifle training with Scott Satterlee, an instructor with Core Shooting Solutions. This video explains why new shooters should consider enrolling in a formal training clinic. Topics covered are: typical course format and “curriculum”, the gear needed to participate in a precision rifle clinic, and skills shooters should practice before attending the clinic. 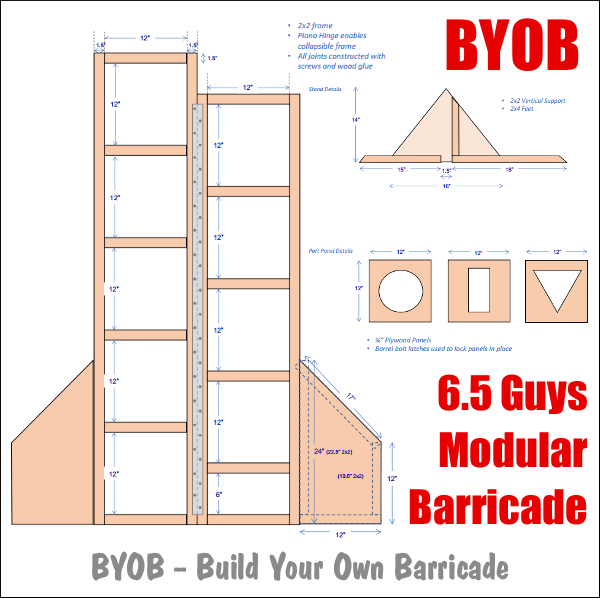 Share the post "BYOB — Build Your Own Barricade (for Tactical Training)"
Head over to Midsouth Shooters Supply for some of the best bargains of the year. 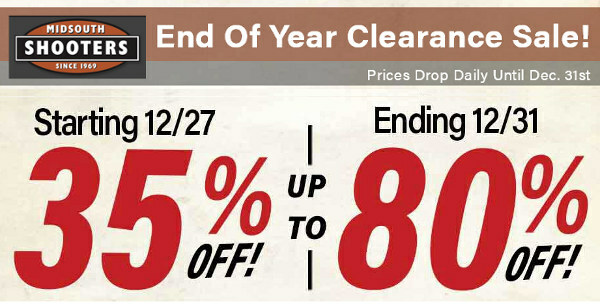 Right now Midsouth is running a huge End of Year Clearance Sale. But this is no ordinary promotion. The deals get better every day until 2018 arrives. You see, every day, through December 31, 2017, prices drop. If you hold out ’til the end, you can score the best deals — up to 80% off the original price. However, if you wait too long, someone else may get the product(s) you want. Over 800 items are on sale including tools, dies, reloading components, ammo, optics, holsters, gun books, and more. You’ll find exceptional pricing on Norma-brand brass as well as Hornady loaded ammunition and reloading gear.Folks — you really should check out this Midsouth Sale. If you time it right you can get items at half-off or better. Here are just three of the Clearance Sale items … there are over 800 more! 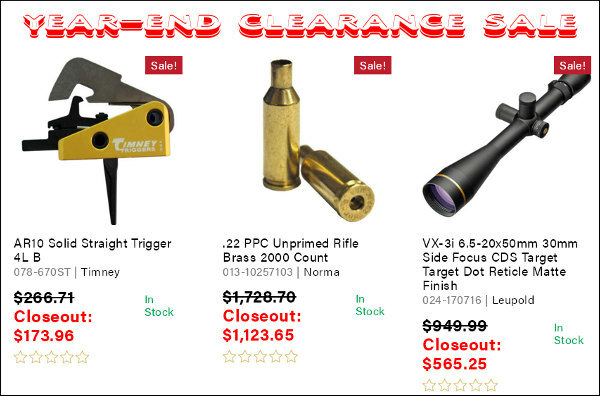 Share the post "Midsouth Clearance — Prices Drop Every Day Until End of Year"